Two Roads Brewing Company, Stratford, CT – Now Beer This! Last week I took a tour of one of Connecticut’s newest breweries, Two Roads Brewing in Stratford, CT. As usual, I am happy to see Connecticut jumping into craft beer, and even more pleased to see a new brewery that’s located close to where I grew up (Bridgeport). Let’s start with the appearance. Two Roads Brewery is located inside of a 100-year old factory building. The building itself is beautiful from the outside, with massive windows that show people outside all the glorious brewing going on inside. The inside has been renovated, scraping away all the old brick and wood of the past. However, the old materials are not gone; the bar inside the tasting room is constructed from recovered wood from the building’s interior. It’s inviting- if I still lived in that area, I would definitely stop in more frequently just to enjoy a pint. I think Two Roads has shown a lot of ambition. I think it’s great that they work with other breweries to do contract brewing- they are really fulfilling a lot of potential with the space. I also thought it was ambitious to start off with multiple beers and making the most of their equipment. A lot of new breweries start small, whether it be a small space or making one brew at a time. But Two Roads already has 4 flagship beers, as well as seasonals and plans for more (I can’t wait to try the oak-aged Russian Imperial Stout! ).They are all solid beers too! I especially like that they aren’t trying to re-invent the wheel here and try to do something no one else has done. They are taking classic styles and making them delicious and drinkable. So far my favorite is their winter seasonal, a biere de garde, which is a nice, cold-weather style to see alongside a sea of winter warmers. It’s nice to have something else for Connecticut to be proud of, and I’m looking forward to seeing what else they come out with! 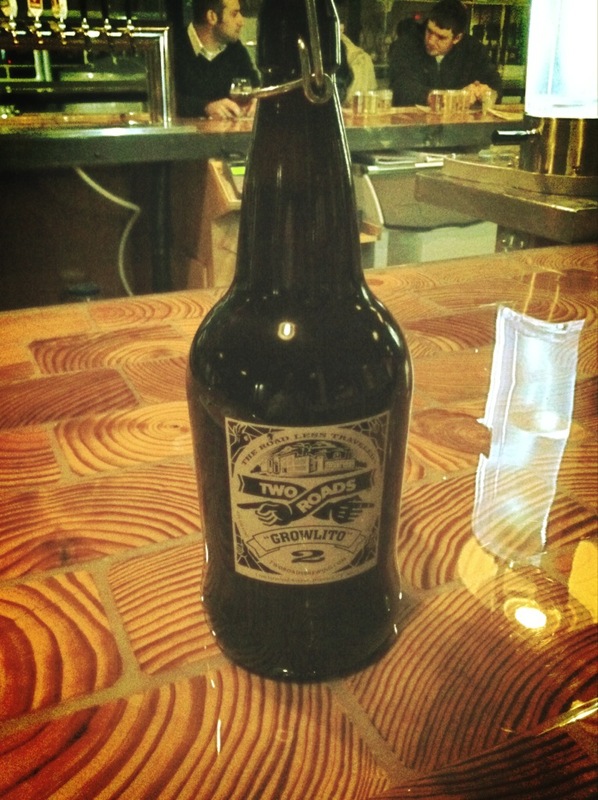 If you are in the area, you can pretty much stop in for a tasting or to fill a growler (or growlito- the 32 oz. version) any time they are open, usually until 8 PM. There are scheduled tours on Saturdays and Sundays at 1 and 3 PM. There is also usually a food truck parked outside on the weekends! For more info, check out their website. Posted on February 14, 2013 February 14, 2013 by nowbeerthisPosted in NewsTagged ctbeer, stratford, tworoads.